The smartest move for real-estate developers is to continue investing in cities that have many transportation options available to their potential tenants. And growing cities need to embrace transit-oriented development to remain competitive. 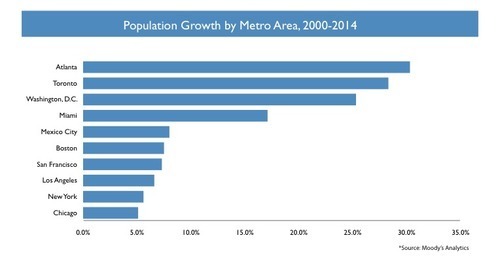 Those are the findings of a recent report that explores 10 major cities (Mexico City, Manhattan, Los Angeles, Chicago, Toronto, Washington D.C., Miami, Atlanta, Boston, and San Francisco) experiencing rapid population growth. Most commercial and residential development in these places has been transit oriented. Underlying the report is the fact that Americans are moving back to the urban core in significant numbers, led by Millennials, who have a distinct generational preference for transit-oriented, walkable urban places. Businesses, too, are choosing to locate in the central cities in greater numbers, eager to gain a competitive advantage by capturing this population of potential employees and consumers. This migration means that growing cities are faced with more traffic congestion and longer commutes. To mitigate these problems, and for cities to remain competitive, the report’s authors say, cities should invest in transit and transit-oriented development. The report acknowledges increased construction costs associated with building TOD, mostly infrastructure improvements and higher land costs. The report finds, too, a value premium associated with TOD: 10 to 25 percent for most markets, with the exception of Manhattan and San Francisco, where almost all development is TOD. Washington D.C. in particular has a significant value premium associated with walkable and transit-adjacent properties: The report quotes a 2011 Washington Metropolitan Area Transit Authority (WMATA) study showing that the value of real estate within a half mile of a Metro station comprises 28 percent of the area’s total. Splash photo uncredited. Story Photo by Miguel Ariel Contreras Drake-McLaughlin on Flickr.